Mr Schad, you are the founder and general manager of SCHAD Oldtimer Manufaktur. Over the last 30 years, through steady and targeted expansion, you have developed your business into one of the leading restoration companies for vintage cars in Europe. What gave you this passion for cars? Bernhard Schad: Every vintage car is unique and has a long history. I find that wonderful, and I would like to preserve this heritage. And that is what motivates me to keep every vintage car in the best condition possible, for as long as possible. Is that the reason why you have developed a patented method of anti-corrosion protection? Bernhard Schad: Yes, because this is an important step in preserving these automotive assets. 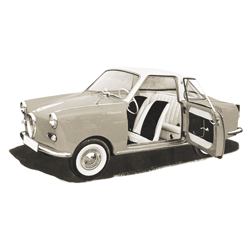 My mother had a Goggomobil, a legendary post-war German microcar. Once when I was 12 years old, I tried to restore its original shine and prevent it from rusting. I used my dad’s tools to sand the rusted spots down, and then applied anti-rust paint. I was so proud – until rust began reappearing all over the car just a few months later. Perhaps this was the start of my obsession with preserving car bodies for all time. What exactly does your patent cover? Bernhard Schad: There are various cathodic dip coating methods available on the market today to provide anti-corrosion protection for vintage car bodies, but they have drawbacks. In these approaches, the car bodies, stripped to bare metal, are usually dipped in the cathodic dip coating basins without turning them. To let air escape, holes are drilled in the car body. But since car bodies have endlessly branching expanses of cavities and curves, it is still impossible to ensure consistent coating of all areas. Numerous points remain that are vulnerable to corrosion, some of which are only revealed after many years. We solved this problem by developing a device that rotates the vintage car bodies in the dip coating basins in an automated process. We hold a patent for this specialised machinery. The idea comes from the manufacturing of new cars. We spent more than a decade experimenting with the idea until we had optimised this approach for vintage cars. Our earliest attempts just looked like a pivoting rack holding the car body, but it evolved into a very complex and extensive project. Given the nature of the cathodic dip coating process, the rotating device must meet various requirements. It must have its own motor, which requires its own power source. Everything has to be insulated against the voltage applied in the dip coating basins. The entire motor unit has to be removable to allow the device, and the car body it holds, to subsequently move through the curing oven at 200 degrees Celsius. And all that needs to happen within a short amount of time in order to avoid interrupting the work process in the cathodic dip coating facility for too long. Today, thanks to our patented method, we can achieve the perfect anti-corrosion protection for vintage cars, on which we give a lifelong guarantee. In our view, this is the only way a high-quality restoration makes sense. 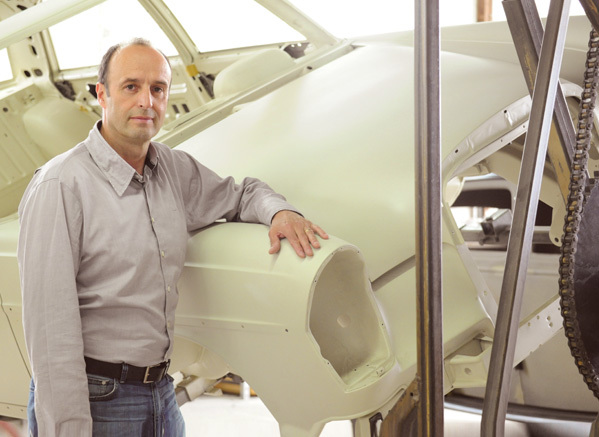 Bernhard Schad is the founder and general manager of Schad Oldtimer Restauration GmbH. He established his first workshop back in 1985. Today, the SCHAD Originale brand stands for finest hand craftsmanship and the latest technologies. 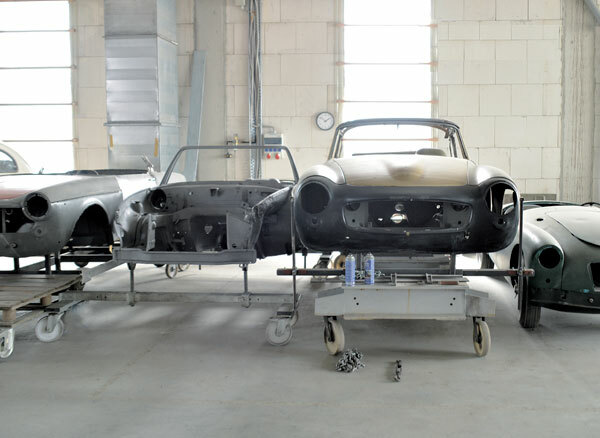 With its three divisions, vintage and classic car restoration, the Mercedes-Benz vintage workshop, and the body and painting workshop for contemporary cars, SCHAD Originale is among the leaders in Europe when it comes to bodywork, painting and anti-corrosion protection. has been a vintage car enthusiast with a passion for automotive craftsmanship since childhood. Always striving for perfection, he has consistently acquired new skills, and today is a certified master craftsman in car body construction and automotive electronics and a master automotive mechanic. In addition, he has extensive training in paintwork with historical paints. But at SCHAD Originale, it is not only about technology, but also about craftsmanship. Bernhard Schad: Naturally, craftsmanship is at the heart of what we do. Several master craftsmen are employed in every area of our workshop. As far as bodywork is concerned, there are only a few workshops that can match the high level of quality in panel beating that we offer. In our paint shop, we can reproduce any historical paint, something which takes a great deal of passion and patience. It gives me a feeling of joy every time we build a flawless new wing for a Rolls-Royce, or perfectly restore the bonnet of a Mercedes Pagoda. Must everything always be new and perfect? Can’t a vintage car also have a certain patina? Bernhard Schad: Of course, that remains completely up to the customer. Our own goal is to preserve the original parts for as long as possible. That is our philosophy. In our view, the production of new parts is only the second-best solution. And what lies ahead for SCHAD Oldtimer Manufaktur? Bernhard Schad: Over the past 30 years, we have developed many competencies. One area which we are currently in the process of developing is accident damage repair. We not only have full expertise in the repair of vintage cars, but also support the car owner at every stage of the process, including paperwork. We work with expert appraisers specialised in valuation of vintage cars, for example, and offer the option of handling the entire process of coordination with the insurance companies. That is usually an enormous relief for our customers. Then we will simply wish SCHAD Oldtimer Manufaktur every success for the future.